One of the oldest roads in the Red River Valley was the Tennessee to Washington (Hempstead County, Arkansas) to Fulton (Hempstead County) trail that was formed along a geological ridge line. Before American settlement, the trace was an aboriginal path to salt “mines” (actually, just places where salt could be sieved and collected) and to the Caddoan settlements along the Red River, specifically the Nasoni villages. Now called the “Southwest Trail” by heritage tourism promoters, the trace witnessed pioneers, stage coaches, traders, Choctaws, Chickasaws, and Union troops moving towards Indian Territory and Texas. The centuries of use has “sunken” the trail in some spots. The sunken trace is best seen on the northern side of Washington‘s Franklin Street. Today, the trail north of Washington is very hard to follow – a lot of the “old southwest Arkansas” between Washington and Blevins was leveled in the 1940s to make way for a military proving grounds. The old trail ran from Tennessee to Little Rock to Washington to Fulton. If you want to travel the original route of the old trail – called the Southwest Trail now to entice motor tourists – you can drive AR 195 from Fulton to Washington. The sunken part of the old trail can be viewed on the north side of Washington along Franklin Street. On the right side of the photograph stand the 1830s’ era courthouse, wonderfully restored. Today, the tavern has been restored to its original look (as best as could be) through the generous donations and hard work of Hempstead County citizens. 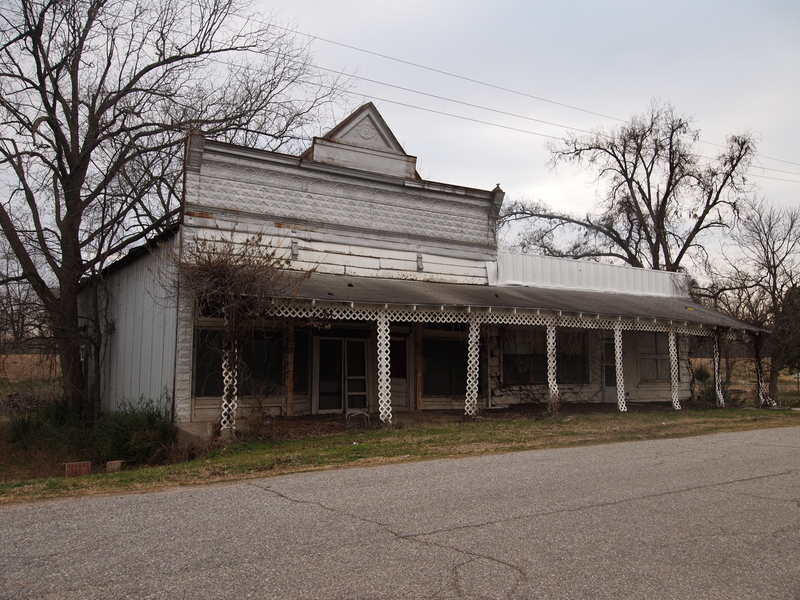 Washington was once the county seat of Hempstead, Arkansas but lost the status when the railroad developed Hope and built the station and town. The whole town, which is home to the Southwest Arkansas Regional Arkives (<– get it?) is now a state park. In the US, death of history is frequent. I’m not talking about historical events today, even though they have their own share of death and destruction. I’m referencing historic preservation, or to put it more bluntly, the complete and utter lack thereof. 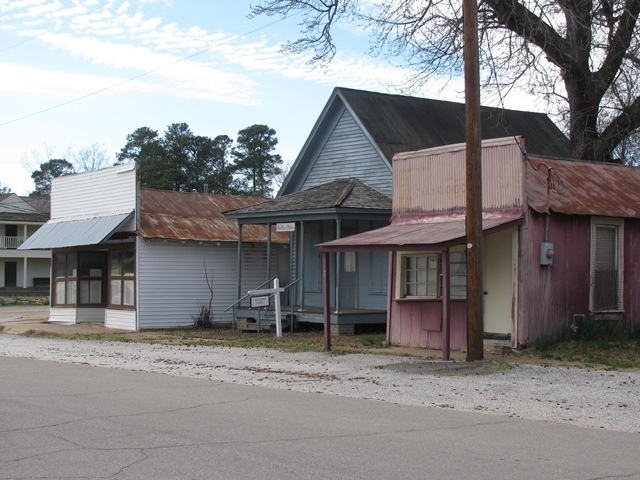 I found myself driving through southwestern Arkansas just this past week, filled with the peculiar anxiety always reserved for the things I hold most dear – old, abandoned buildings that have historical significance but have been neglected and forgotten for new and shinier places. Each time I re-visit a ghost town or some abandoned place that I’ve previously chronicled, my nerves get edgy, as I am scared to discover that another piece of history may have been destroyed. My fears were confirmed in Fulton, Hempstead County, Arkansas. I have a major soft spot for this little town, which has so much history behind it. It sits right alongside the Great Bend of the Red River, and its levees are still tall and sturdy. Since its inception, Fulton served as a major crossroads. First, it was the river crossing for people headed to Mexican Texas. Then, it was mentioned as the terminus of the first proposed transcontinental railroad (Cairo & Fulton RR). 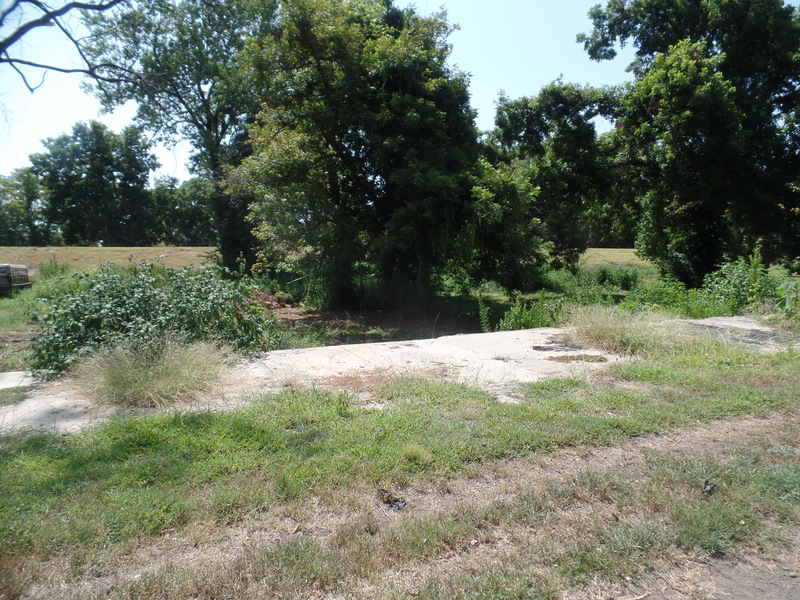 By the 1920s, the Bankhead Highway cut a path right alongside this once very important town. There are only a handful of reminders that point to this hamlet’s history. There’s the railroad bridge, rebuilt after the flood of 1927. Then there’s the water well, now ensconced in a derelict wooden building. You can still see the steamboat docks and moorings on the eastern bank of the Red River, too. And lastly, a lone commercial building, probably built around the turn of the 20th century, stood in a dilapidated state across from the post office. When I visited Fulton in August of 2015, I discovered that this beautiful old building had been razed. The facade, with its tin cornice, was nowhere to be seen. All foundations, bricks, wood, shingles… everything had been bulldozed. All that sits there now is an empty, gaping maw. I don’t know if anyone in Fulton cried when it went away, this last vestige of a once-important town that the interstate unceremoniously bypassed. But I did. I cried bitter, bitter tears over this death. The building was in a horrible state, for sure. The back had caved in, and its crumbling walls – whatever was left of its walls – exposed the interior to the elements. But the front part of the building was in good order. It could have been sheered off and then braced. It could have been simply a gateway that stood to frame the levee… anything rather than just some other damned hole in the ground. You may wonder, what if the property owner didn’t have the money to do all this? The building was a hazard and could have well exposed the owner to lawsuits if someone trespassed. These are all good arguments. But, here’s the thing – we cannot keep letting private property rights and obligations get in the way of historic preservation. This country, these states, this town need programs that allow for the reclamation of history. Let eminent domain take over, if it has to. Compensate the owner and then preserve the building, through federal and state grants. Don’t tell me this country doesn’t have the money, either. We’re the richest country on earth. We just allow our wealth – oil wealth, coal wealth, manufactured wealth – to remain in the hands of the oligarchy who provide mere snippets to the rest of us plebeians,and that’s why we think our country is bankrupt. Believe me, we’re not. If we were, we wouldn’t be able to fight all these wars over which our plebeian sons and daughters get killed. We’re a nation that loves private property. I get that. I also get that it has been, historically, a detriment for most put-upon people. Native American tribes understand that all too well. So do African Americans, whose ancestors were forced into perpetual slavery and were not even considered fully human. Women get it, too – for centuries, they were their husband’s property and as married women, could not rightfully claim property of their own unless it was specifically bequeathed to them. And you know what else is put upon? Our heritage. That little building in Fulton was a fantastic link to the past – our shared past, warts and all. And we simply have to stand back and watch our history get destroyed, one building at a time, because we’re not allowed to own that past. And then we scrape up all the money we can to visit Europe, so that we can marvel at their old buildings. Am I missing something here? The old story of the “Arkansas Traveler” tells of a person coming through the backwoods of Arkansas and happening upon a house. The traveler is lost or maybe just curious, and the house’s inhabitants answer his questions – such as “Where is the nearest town?” or “What do you do here for fun?” – in a roundabout manner… “It’s closest to the nearest signpost” or “Spit upwind and see on who it lands.” The conversation then devolves from there. Depending on the person telling the tale, it either makes fun of the foreign nube or the Arkansas dude. “Arkansas Traveler” by Herb Block, 1937, Library of Congress. 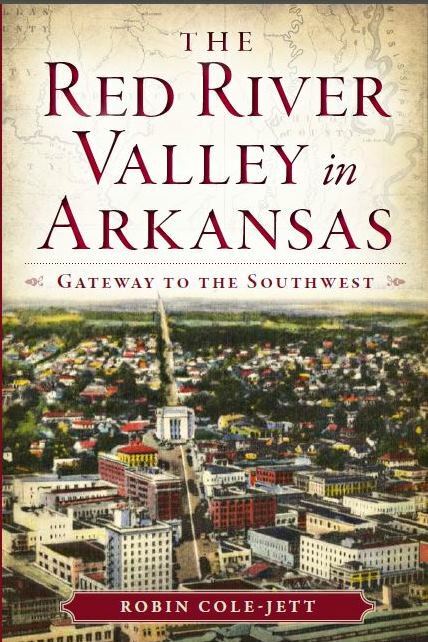 I’ve been traveling through Arkansas on and off for the last six months to complete my newest book, The Red River in Arkansas: Gateway to the Southwest (The History Press, forthcoming February 2014), and all I can say is that I’ve never met nicer folks or a more interesting section of the Red River Valley. The Red River makes a big bend right alongside the old steamboat port of Fulton. All rivers have their bends, some more than others (the Red River exhibits several, actually). What makes the Great Bend so important to the Red is that it changes the nature of the river, as it falls from a west -to-east stream to a north-to-south stream. This also means that it changes from a sandy, broad, and not-very-navigable river to a narrower, deeper, and navigable channel. And not just that; the culture of the river changes, too. The American West, with its nomadic native tribes and its reliance on range animals, gives way to the Old South, with its reliance on cotton economy, race, and the plantation system. Yeah, I’m painting with broad strokes here, but history bears me out. 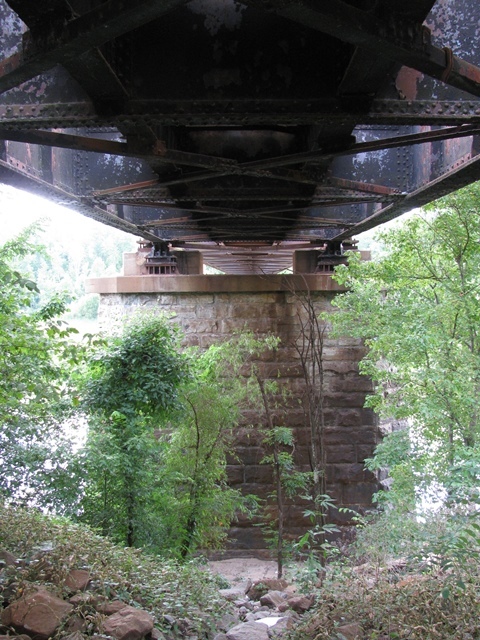 The railroad bridge above the Red River at Fulton. Fulton, like the rest of the Old Southwest before the Civil War, succumbed to the modern age of the railroads and automobiles. There’s not much left to indicate what the area used to look like, or how busy it once was. Floods and new cities, such as Texarkana and Hope, replaced the older settlements in economics and location, just like the older Anglo settlements replaced the Caddoan villages that dotted the Red River before the Louisiana Purchase. Progress, whether good or bad, has made its mark on this small but incredibly diverse portion of the Red River. It fascinates me to no end, and provides me with ample opportunity to try to discover remnants of what used-to-be. A great place to begin this historical exploration is Washington State Historic Park, located along the Southwest Trail (the Old Chihuahua Trail, now State Road 195) a few miles northeast of Fulton. There, the traveler can discover the importance of Hempstead County’s first seat and the temporary capital of Arkansas during the Civil War, with two courthouses, plenty of vintage houses, a recreation of the blacksmith shop where James Bowie supposedly had his famous knife designed, and the largest magnolia tree in the state. The Southwest Arkansas Regional Archives are there as well, with tons of information – including maps and photographs – about the area. Washington and Fulton are both on this Southwest Trail, the main road that led people like Stephen F. Austin and his original 300 settlers into Texas. What I found interesting is that the trail is well-marked between Washington and Fulton, but north of Washington, the road becomes indistinguishable amid a plethora of dirt roads. I tried to follow the old trail, but got lost. I reckon the tale of the Arkansas Traveler is still pretty pertinent. The book will appear at stores and online in February 2014! You know you want it.